The ECB surprised global markets by cutting its refinancing rate to a record low of 0.05%. In addition President Mario Draghi announced that the central bank will start buying private debt next month in an attempt to fend off deflation. Consequently, the shared currency fell by 207 points against the US dollar to reach $1.2943, its weakest level in more than a year. For once the economic data coming out of Europe actually gave ECB President Mario Draghi some ammunition. Manufacturing figures in Spain and Ireland, where reforms were applied in exchange for bailouts, were a pleasant surprise. This pushed the shared currency 18 points higher against the dollar to $1.3150 ahead of today's interest rate meeting. Speculation that the economic outlook in the US might convince the Fed to raise rates sooner than expected pushed the dollar to a recent intraday high against the euro, $1.3110. However, the trend reversed course during the afternoon session as investors remain unsure about the likely course of action the ECB will adopt at its interest rate meeting on Thursday. 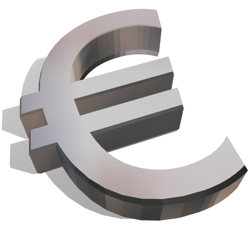 The euro continued its plunge against the dollar yesterday following ongoing signs that the common area is struggling to keep up with its counterpart across the Atlantic. Manufacturing data from Europe was weaker than estimated and fuelled speculation that Mario Draghi may have to take action at the ECB meeting later this week. The shared currency reached its lowest intraday level against the dollar since 6 September 2013 by hitting the $1.3133 level on Friday. We have seen heightened demand for the dollar following the conflict in Ukraine and the ongoing economic recovery in the US. In addition, there's growing speculation on this side of the pond that the ECB is set to expand its monetary stimulus. Ultimately, the EUR/USD pair closed 43 points lower, ending the week at $1.3139.